In February, nearly 100 design teams from all around the world submitted ideas for Buffalo’s DL&W rail corridor. These visionary concepts will lay the groundwork for transforming the abandoned 1.5-mile corridor into an iconic, innovative and inspiring multi-use nature trail and greenway. The DL&W corridor runs through Buffalo’s Old First Ward, The Valley and the Perry neighborhoods as it connects Buffalo’s downtown with its waterfront. 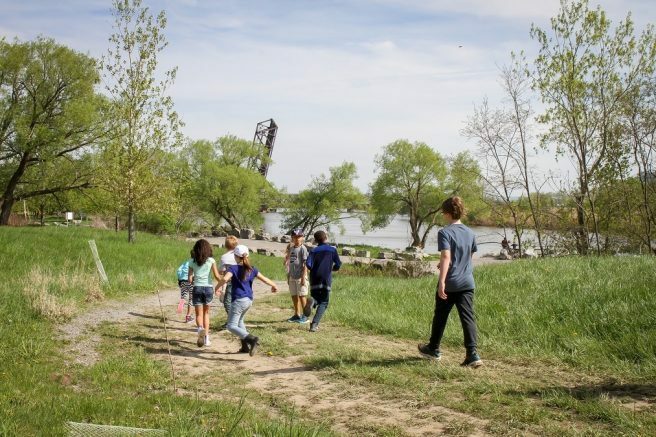 This new trail will connect people to nature and to one another, providing opportunities for health and vibrancy that contribute to our region’s renaissance. The goal of the competition is to develop both creative ideas and practical solutions that will be showcased to the public. While three of the designs will be awarded prizes by a prestigious jury, one lucky team will be selected to receive the Community Choice Award. The Western New York Land Conservancy needs help from the public to determine which team gets that honor. The Land Conservancy will also work with the project committee and residents of the three neighborhoods adjacent to the corridor to get their input. Nature lovers, trail users and people excited about the revitalization of Buffalo’s waterfront and communities are encouraged to visit wnylc.org/vote to help choose the winner of the Community Choice Award. Online voting will be open through March 25. “We are looking forward to seeing what designs and features the community likes as the project moves closer to becoming a reality,” said Sara Heidinger, president of the Old First Ward Community Association and co-owner of Undergrounds Coffee House & Roastery. Sara is also serving on the jury that will be selecting the other winners of the competition. The public will be invited to attend an exhibition of the top designs at the M&T Center at 3 Fountain Plaza in downtown Buffalo on April 10. Winners of all four awards will be announced later this spring. The Design Ideas Competition is made possible through generous support from BlueCross BlueShield of Western New York Blue Fund, M&T Bank, the Ralph C. Wilson Jr. Legacy Funds at the Community Foundation for Greater Buffalo, New York State Department of Environmental Conservation and the Land Trust Alliance, Rails-to-Trails Conservancy through the Doppelt Family Trail Development Fund, and numerous individual Land Conservancy members and donors. The total funding raised for the project to date is close to $1 million, including the recently announced $369,000 grant from the New York State Office of Parks, Recreation and Historic Preservation that will fund the next phase, which is concept and schematic design. If you are interested in learning more about the project, the competition or the Western New York Land Conservancy, please visit wnylc.org/dlw or reach out at (716) 687-1225 or info@wnylc.org. You can also support the Land Conservancy’s work by making an online donation at wnylc.org or by sending a check to P.O. Box 471, East Aurora, N.Y. 14052. The Western New York Land Conservancy is a regional, not-for-profit land trust that permanently protects land with significant conservation value in Western New York for current and future generations. The Land Conservancy envisions a future in which open spaces, working lands, wildlife habitat and scenic beauty are cherished and protected as part of the landscape and character of Western New York. The Land Conservancy is accredited by the Land Trust Accreditation Commission and is one of 1,000-plus land trusts nationwide, including 90 in New York State. Land trusts have protected 56 million acres of land. For more information on upcoming events, volunteer opportunities or the mission of the Land Conservancy, please call (716) 687-1225 or visit www.wnylc.org. Be the first to comment on "Cast your vote for the DL&W Corridor Design Ideas Competition"